Raster of multiple polygon associating values in R? I am new to R-Gis. Here is what I need to do, I need to make a raster inside the larger polygon (image above) each cell has to be 10x10 m, mask it to cut cells outside the the larger polygon and then assign a different value for each cell in the smaller polygons. Furthermore, I'd like to have a list (dataframe) with the coordinate of the center of each cell and the value associated to it. First, you cannot arbitrary assign a desired projection, you need to actually transform the data into a different projection. Here we assign the correct projection and then transform the data into a UTM projection. It will also be easier to work with a SpatialPolygonsDataFrame so, we will coerce into this class as well. utm = "+proj=utm +zone=23 +south +ellps=WGS84 +towgs84=0,0,0,0,0,0,0 +units=m +no_defs"
Now, we can create an empty raster to use in rasterizing your polygons. The result will be a unique raster value for each polygon. 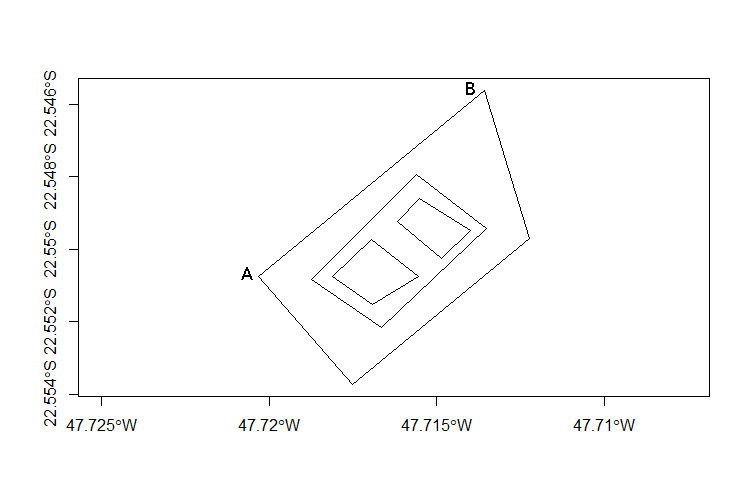 To get at the coordinates of the raster cells you can just coerce to a SpatialPointsDataFrame. The coordinates slot corresponds to each row in the @data slot containing a data.frame of the attributes.